Over 1000 marches, actions, events and rallies will take place in all 50 states, as part of Campaign Nonviolence’s upcoming “Week of Actions” culminating on International Day of Peace. People nationwide are joining together to urgently insist on unity and peace. Thousands will be participating in Campaign Nonviolence’s “Week of Actions” from September 16-24, 2017. This unprecedented nationwide campaign of grassroots activism calls for an urgent unifying peace that is free from racism, war, poverty, and environmental destruction. Campaign Nonviolence has grown from 230 events in its inaugural year of 2014, to more than 1,000 events today. Campaign Nonviolence is sponsored by Pace e Bene, a non-profit organization building a culture of peace through active nonviolence and shared understanding and partnerships that protect human rights, abolish war and nuclear weapons, end poverty, challenge injustice, heal the planet—and meet today’s profound spiritual task: to create a just, peaceful and nonviolent world. True to the vision of Dr. Martin Luther King, Jr., Campaign Nonviolence teaches how to resolve conflicts peacefully at home and abroad. The peace movement in the United States, What are its strengths and weaknesses? Following are a sampling of planned events. * Delaware Peace Week will hold more than 60 events from vigils and teach-ins to meetings statewide. * Raleigh and Chapel Hill, North Carolina, have declared “Campaign Nonviolence North Carolina Week,” with events that will advance a peace free from racism and discrimination, poverty, war, and environmental destruction. * The Chicago area will host 100 events in support of nonviolence and the environment. *	To date, 1,000 people are expected to join the Lancaster, Pennsylvania, Peace Fest in Binns Park on Sunday, Sept. 24. Featured will be four bands and speakers that include the Rev. John Dear. *	Marches, prayer services, vigils, workshops, teach-ins, and rallies nationwide will include major events in Little Rock, Arkansas; Memphis, Tennessee; Albuquerque, New Mexico; Clinton, Iowa; Huntington, Indiana; Bangor, Maine; Lansing, Michigan; and Erie, Pennsylvania. 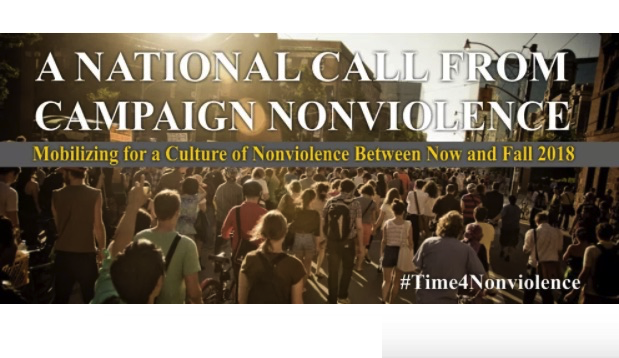 For a list of peacemaking rallies, with states and cities, descriptions, organizations and contact information, please visit: actions.campaignnonviolence.org. Campaign Nonviolence is sponsored by Pace e Bene, a nonprofit, tax-exempt organization founded in 1989 by the Franciscan Friars of California. Campaign coordinators Ken Butigan and Father John Dear teach that nonviolence most effectively characterizes Jesus’ way. “It is a way that combines both the unmistakable rejection of violence, and the power of love and truth in action for justice, peace, and the integrity of creation.” For more information please visit: http://www.paceebene.org/about.